You Have To Dig Deep To Find Us A Storm. Parking Lot Piles Of "Yuck" In Roswell, New Mexico Monday, January 18, 2016. My wife and I drove up to Roswell yesterday afternoon and you can still see patches of snow on the open ground from Artesia to Roswell. Some of the deeper drifts are still 1 feet to 2 feet high. The last time I saw any snow on the ground this long was 18 years ago during the Christmas Week Storm of 1997. GFS Hints At A Weak Winter Storm In A Week...Maybe? 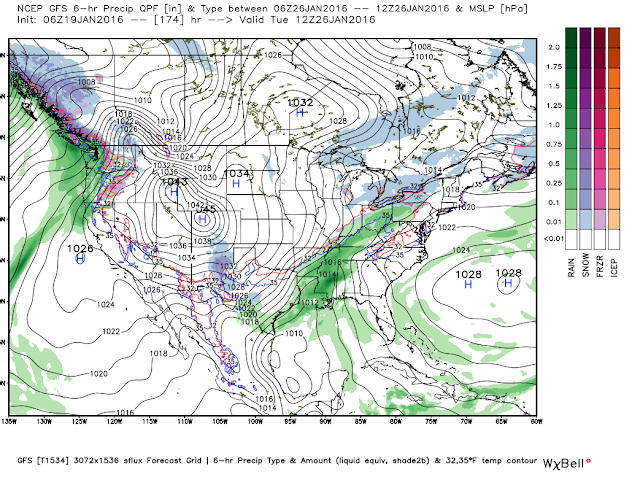 06Z/11 PM GFS 500 MB Forecast. 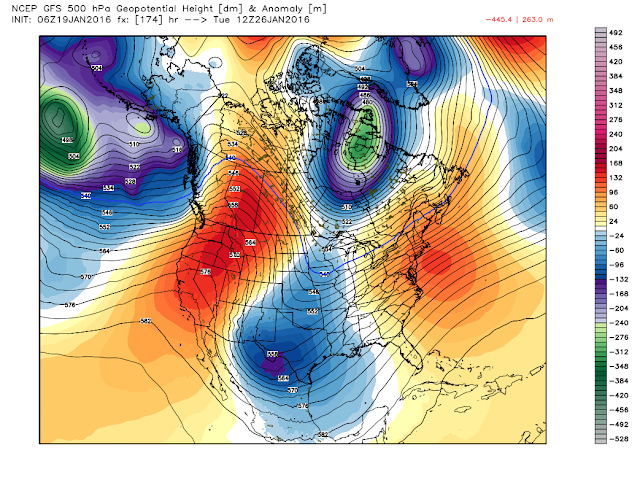 Valid @ 5AM MST Tuesday, Jan 26, 2016. 06Z/11 PM GFS Surface Forecast. Mother Nature Slapped Us Really Hard & Then Ran Off. 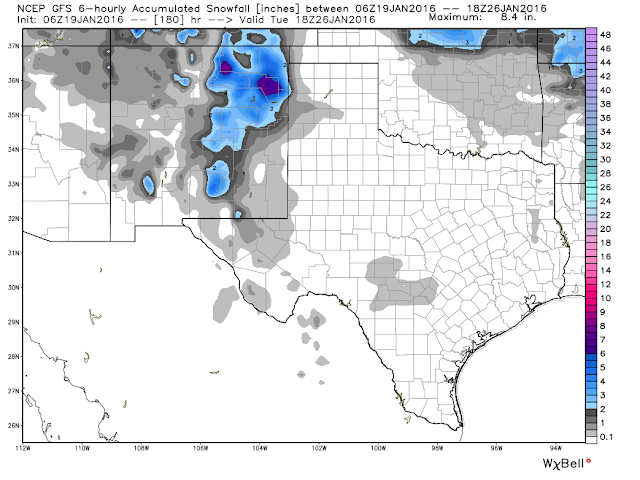 You have to dig deep into the model forecasts to come up with a winter storm for eastern and southeastern New Mexico. In fact the Canadian and European models aren't seeing what the GFS model depicted above is forecasting a week from now. So at this point in time I'm not going to get too excited about this just yet. We've been experiencing the mid winter pause as some like to call it. Overall at least locally it has been fairly quiet for the past couple of weeks. This won't last and the longer range forecasts are hinting of a pattern change (a more active subtropical jet stream with more winter storms to impact New Mexico) which should bring the storm track back into the area later this month into at least the first part of February. 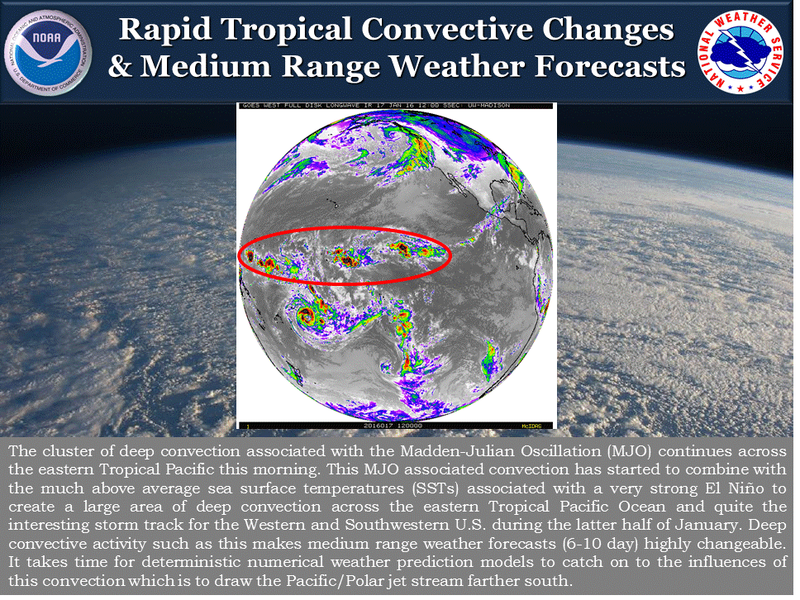 A major player in this will be the MJO depicted in the graphic below. What a crazy winter this has been for us locally. Meteorologically speaking winter started December 1st. It was hard to tell though locally since most of the December 2015 in southeastern New Mexico was warm and tranquil...that is until the 26th. That's when mother nature unleashed a Historical Blizzard that paralyzed us locally for a week. Mother nature punished us really hard then took a vacation it seems. The mountains of the state have done really well so far this winter. Roswell Climate Co-Op Station 16.8"? My Snowfall Total (2.1 NNW Downtown Carlsbad) 14.0"
2.0 North Of Carlsbad 11.0"
Artesia Climate Co-Op Station 10.0"? Carlsbad Climate Co-Op Station 7.5"? Brantley Dam Climate Co-Op Station 6.5"
33.3 WSW Carlsbad (Queen) 6.3"
Tatum Climate Co-Op Station 10.5"? Caprock Climate Co-Op Station 8.0"? Picacho Climate Co-Op Station 18.0"? Cloudcroft Climate Co-Op Station 51.0"? Elk Climate Co-Op Station 18.0"? New Mexico Ski Resort Seasonal Snowfall Totals. Please Note: Getting an accurate measurement on the correct snowfall totals that fell during the Christmas Weekend Blizzard of 2015 was a daunting challenge. The 50 to 82 mph gusts obviously made this task difficult to nearly impossible in some locations. These wind gusts left areas of exposed ground with no snow cover, and yet several feet or yards away you would have drifts that ranged anywhere from 1 feet to over 8 feet high. The question mark means that not all of the current data is available from the National Weather Service Climate Co-Op Stations. Some of the snowfall totals listed above are not a very good representation of what has fallen so far this winter. The public did a really good job in my opinion in reporting local snowfall totals during this event. 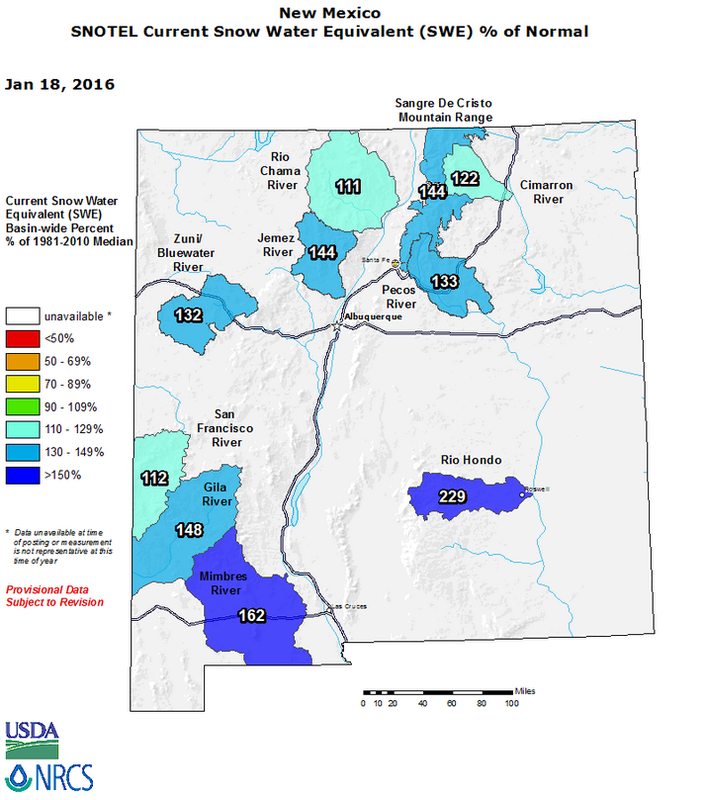 Widespread storm snowfall totals of 12" to 24" were common in Eddy, Lea, Chaves, Lincoln, and Otero Counties. CoCoRaHS has a very good training aid/slide shows program to help teach an observer how to properly measure rainfall and snowfall totals. You can view the snowfall slideshow via this link.